Diving to prescribe limits, including a depth no greater than 40 meters, using only compressed air and never requiring a decompression stop. 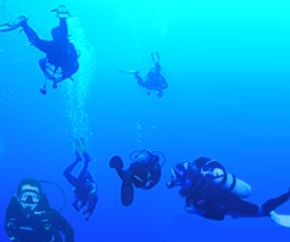 Recreational scuba diving, as taught by national certifying agencies, is defined as diving that: - Uses only compressed air as the breathing mixture. - Is never done solo. - Does not exceed a depth of 130 feet. - Has a depth-time profile not requiring a decompression stop; if necessary one can ascend to the surface without stopping. - Does not require specialized training beyond the basic open water course.